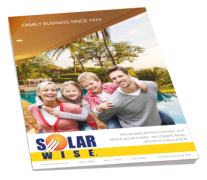 Download the latest SolarWise Product Brochure. "We have no hesitation in recommending QIS Solarwise and have found their service and expertise to be of a very high standard." "Thank you for the prompt answer yesterday. Thank you very much. I will recommend your services as much as I can. I don’t remember the last time I was so happy about a company." "Also wanted to compliment Rob's work, he was very nice, very helpful – Left us IMPRESSED – Definitely will be referring family and friends to us!"